About a century ago the North of Amsterdam hosted all of the city’s heavy industry. Due to the presence of the Fokker aircraft factory the North has been the only part of Amsterdam being bombed during WWII. Most bombs missed the factory heavily damaging surrounding residential areas. Still, every year, on the 17th of July, this tragic event is commemorated at De Nieuwe Noorder. After the war the ship-building industry got back on track but not for long. During the sixties the majority of wharfs bankrupted leaving the neighborhood dotted with industrial scars. In those days, no Amsterdammer would ever consider to cross the river for fun. The disconsolate North was heading straight for oblivion if it wasn’t for the Municipality. For the last decades they have strategically planned a course-change piloting North towards sheer popularity. It started with former industrial plots being transformed into creative workplaces followed by some brave entrepreneurs from the catering industry setting up shop in containers, tents and old factory’s. At first the Amsterdammers were a bit suspicious, but soon the word got out: North is the new hotspot. In addition, North has a pleasant open and airy layout, is located close to characteristic villages such as Durgerdam and Ransdorp and hosts many large parks. Since housing is still kind of affordable more and more young families pick up their household to start a new live on ‘the other side of the river’. Your first mission: find us! Since we have been all self-glorifying about our unique location we want to be honest about one thing: we’re impossible to find! No worries, that only applies for your first attempt. We’re just managing expectations (avoiding divorces and such); once you get it you can’t believe you got confused the first time. There’s roughly four ways to get to us: by foot or by (rental) bike, with your own (rental) car or by taxi, by public transportation or by boat. We’ll discuss the first three. Once you arranged your own boat to get around town, which quite frankly is not a bad thought, we’ll talk again. The airport is not far from the city center. By taxi it takes approx. 30 minutes to get to Asile Flottant, but quite a bit longer during rush hours. The cost of a taxi from the airport will be around 70 euros. The train is a lot cheaper and quite convenient since the airport houses a railway station with direct links to the Central Railway Station (approx. 15 minutes/ 5 euros one way). From there you can either continue by a free ferry and by foot, metro or by bus. Do as the Romans do and hop on a (rental) bike. Pouring rain, blizzards or a heatwave; the Dutch bicycle 365 days per year and that’s not without a reason. The city of Amsterdam is extremely bike friendly and rather car-unfriendly. Also, our capital is quite small compared to other European cities. Asile Flottant is in an area called Noord (North). If you look at the map it’s everything north of the big river dividing the city. The part directly south of the river is the historic city center. The Central Train Station, as well as all other neighborhoods that are of interest, are also on that side of the river. There’s a free ferry (if you’re by foot or by bike, cars are not allowed on the ferry) running 24/7; more or less continuously during the day and less frequent during the nights. Once you are here we help you to install the Pontveer app so you know exactly when it runs. 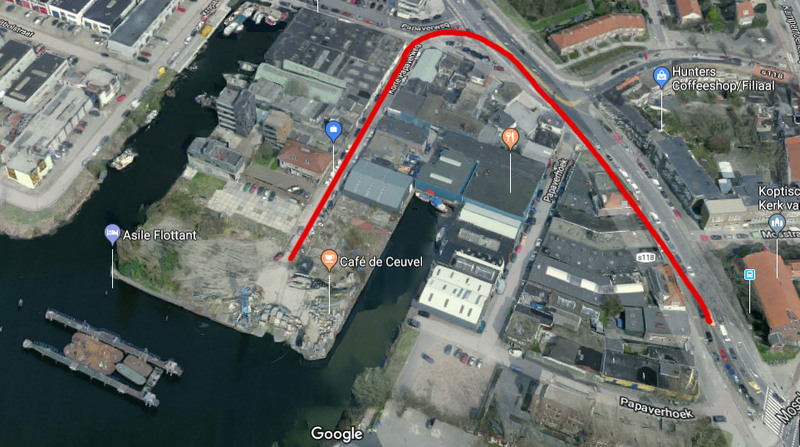 The ferries depart from the Central Train Station, make sure you take the one that goes straight across to Buiksloterweg. After just 1 or 2 minutes you arrive in Noord where you continue in the direction of the ferry: straight ahead on the red bike path. When you hit the Van Der Pekstraat you keep going straight until you hit a roundabout at the Mosplein. On the square you look for a bike lane turning left underneath the main road turning immediately right keeping the big, ugly and yellowish NH Hotel on your left-hand side when moving on. If you navigated correctly you’ll find yourself on the Papaverweg. From here you take the 3rd street to the left, the Korte Papaverweg. If you think you’ve taken a wrong turn and reached a slummy backwater, then you’re probably on the right track! This three-penny street might not be the red carpet you deserve but this is your last hurdle. Paradise is now within reach. Look straight ahead and you’ll see a big wooden sign: De Ceuvel. You have made it! You’ll find Asile Flottant behind the gate at the end of this street. Walk through the main entrance and across De Ceuvel site. The hotel boats are behind another gate, on the wooden jetty in the canal. Despite the rather impossible instructions above, from the ferry to Asile Flottant should take you no more than 5 minutes of peddling. Add another 10 minutes for navigating and swearing and still there’s not much to worry about. If you can roam for free just use your phone for directions and forget all the above. Asile Flottant pops up in Google Maps and Apple Maps. On the river-side of the Central Railway Station you’ll find an elevated bus platform. You’ll need to figure out where bus 391/394 departs from. Once you’re on the bus you have to exit at the 2nd stop: Mosplein. Check the ‘By foot or by bike’ section for directions from Mosplein to Asile Flottant. Once the bus departs the whole trip, including the walk, should take you around 15 minutes. Since July 2018 there is a metro available from Amsterdam Central station to Metro station: Noorderpark, which takes only 2 minutes. From there it is a 10 minutes walk to our Hotel. Tell your car navigation you want to go to Asile Flottant, De Ceuvel or Korte papaverweg and follow instructions. Asile Flottant is not far from ring road exit number 116 and for that matter we are relatively easy to be reached by car. If you’re lucky, one of our three parking lots is still available when you make your reservation (don’t forget to tell us you’re coming by car!). If not, you can park in the area (paid) and you have to walk for a couple of minutes depending on how lucky you are finding a good spot. Keep in mind that your car is really of no use when sightseeing the citycenter. The roads are complicated, parking spots are rare and expensive and the old canals are anything but a relaxed circuit for foreigners. From anywhere in town you can grab a taxi or an Über. All drivers will know the address. Unfortunately, Dutch taxis are more expensive than most other European countries.